I know sit and I also walk nicely on leash. You'll find me a good companion for walks. I'm an energetic boy; however, I listen well and will settle down when you ask me. I keep my kennel nice and clean here at the shelter. I shy away from motion around my head, so please don't just reach out to pet my head. You'll need to take that slow so I get used to your hand reaching out to love on me. Kids tend to reach for dog's heads, so families with young children are not an ideal fit for me. I will do fine with other dogs in the family, but no cats please. 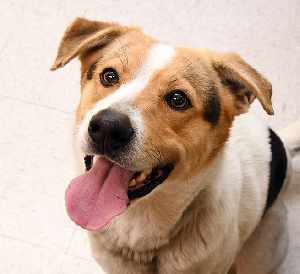 I'm a 1- to 3-year-old, mixed breed who weighs 32 lbs. I'm mostly white with tricolor patches and I have a white blaze on my face that runs from my nose to my shoulders. I am a cool cat with a mellow and relaxed attitude. I love to be lazy and you'll find me just relaxing in my cage. Picture me laying on your sofa, in a sunny window, or even snuggling in your lap. You will want to get a covered litter box for me as I like to potty as close to the edge as possible. I had a gastrointestinal problem when I came to the shelter. Now that I'm feeling better, I'm playful too. You'll need to keep me on a prescription diet as I have a very sensitive stomach. I eat Royal Canin Gastrointestinal here at the shelter. I want to emphasize this because having even 1 treat will cause it to flare up again. 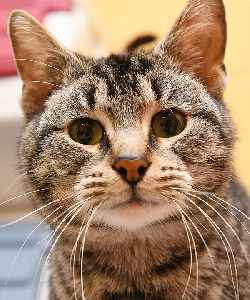 I'm a 5- to 7-year-old, male, brown Tabby. I'm NEUTERED, up-to-date on vaccinations, and $45 to adopt.